Lower limb angioplasty is commonly performed via antegrade common femoral artery (CFA) puncture, followed by selective superficial femoral artery (SFA) catheterization. Arterial access can be complicated by a “hostile groin” (scarring, obesity, or previous failed CFA puncture). We prospectively investigated color duplex ultrasound (CDU)-guided SFA access for radiological interventions. Antegrade CDU-guided CFA and SFA puncture were compared in 30 patients requiring intervention for severe leg ischemia who had hostile groins. Demographics, screen time, radiation dose, intervention, and complications were prospectively recorded. Treatment in 30 patients involved 44 angioplasties (40 transluminal, 4 subintimal) and 2 diagnostic angiograms. Fifteen of these patients had CDU-guided CFA punctures; in 8 of these patients CDU-guided CFA puncture “failed” (i.e., there was failure to pass a guidewire or catheter into the CFA or SFA), necessitating immediate direct CDU-guided SFA puncture. Overall, the mean screen time and radiation dosage, via direct CDU-guided SFA puncture in 30 patients, was 4.8 min and 464 Gy cm2 respectively. With CDU-guided CFA puncture, mean screen time (10 min), radiation dose (2023 Gy cm2), and complications (13%) were greater when compared with the SFA puncture results overall and in the same patients at subsequent similar procedures (2.7 min, 379 Gy cm2 (p < 0.05), no complications in this subgroup). Five complications occurred: 2 each at CFA and SFA entry sites, and 1 angioplasty embolus. 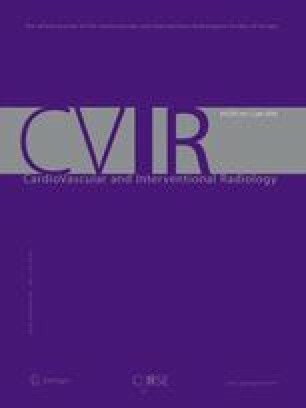 The CDU-guided SFA puncture technique was both more effective than CDU-guided CFA access in patients with scarred groins, obesity, or failed CFA punctures and safer, with reduced screen times, radiation doses, and complications.